Sing! We love to sing fun songs, and our family haggadah was mostly songs. We suggest practicing before the big day by singing the songs in advance. Clap along for even more fun. Cook together. My kids love to help in the kitchen. Charoset is the most exciting for them because they use the food processor, but they also enjoy mixing up the matzo ball batter and peeling eggs. Their favorite part is making homemade macaroons, and dipping them in melted chocolate. Check out my popular recipe for chicken soup here — you can use either chicken with the bone or just the carcass. Decorate. At preschool, our kids painted plastic wine glasses for Elijah and made their own matzo covers for the Afikomen, and the big kids are sewing pillows for their chairs. We love to draw pictures, which we hang on the wall with blue painter’s tape. Practice. The more familiar the children are with the concept of a seder, the better they behave during the event itself. We build up anticipation by discussing the afikomen, asking the four questions, and the songs. Include Hebrew. Kids are great with foreign languages, the younger the better. So no need to do all English songs. From Dayenu to the prayers, my kids can sign the Hebrew songs better than I can. Age Appropriate Passover Story. We use the phrase “when we were slaves in Egypt” and sing the song about banging our hammers, but don’t talk about living conditions. Similarly, our rabbi told the children that Moses’ mother didn’t want her son to be a slave, so he gently placed him in a basket and carefully floated him down the river, where his family took care of him. Be cautious, but do tell the story. Relax! Not only is reclining a part of the Passover seder, but it’s a great idea with little kids not to get too wound up in the process. If your kids are still toddlers, keep the service short, and allow them to leave the table after a certain amount of time. Or have them bring crayons and paper. The idea is to enjoy your holiday after all the hard work! 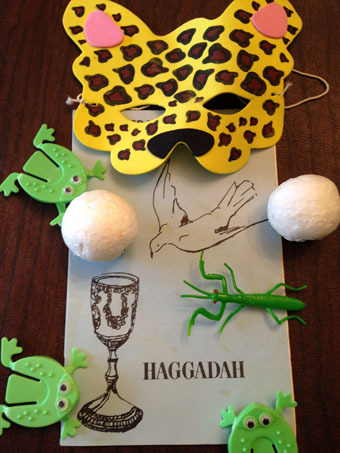 Check out this special young children’s Haggadah that my mother Joan Keston helped create for the Bethesda-Chevy Chase Jewish Community Group which we used when we were little. What are your family’s favorite traditions? ← Smart Estate Planning: Should You Have a Will or a Trust?